This egg salad recipe is as classic as they come. 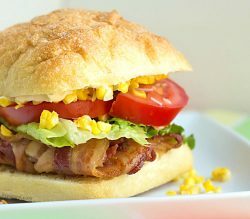 Made with real mayo, mustard, dill, and spices, it makes a delicious sandwich or salad, topped with oven roasted tomatoes. I am still in shock at how mild of a winter it’s been for northeastern Wisconsin. As I type this, the sun is bursting through my window, casting its warm glow onto my cheeks. It feels wonderful. Next week, we turn our clocks forward an hour, which means that Easter is right around the corner. The great news about that is where there is Easter, there are sure to Easter eggs! I LOVE hard boiled eggs. OK, truth be told, I mostly love the whites. With a sprinkle of salt and a smattering of fresh dill, those bland egg whites become an explosion of fat-free, protein packed flavor in my mouth. 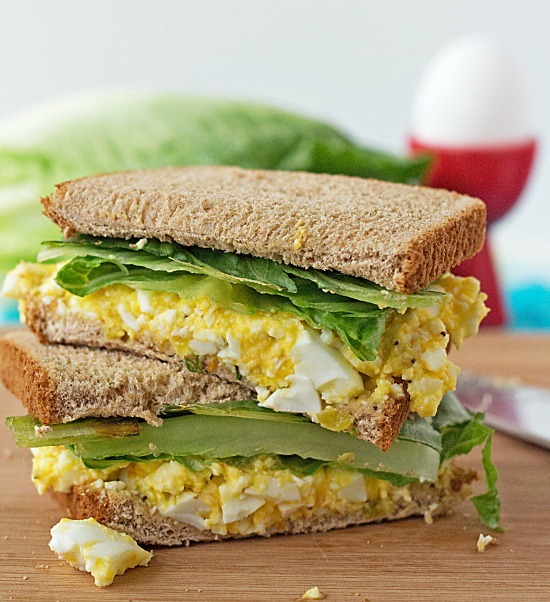 Add a touch of mayo and you’ve got yourself the makings of an amazing egg salad sandwich! Since I’m trying to make healthier eating choices, I decided to forgo the bread this time around and shoot for eating some iron packed, healthy greens. Enter baby spinach. One of the few leafy greens that I can’t get enough of. Need proof of my spinach devotion? 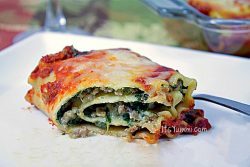 Check out my recipe for steakhouse style creamed spinach. Yummi to the umpth degree! For a burst of color and another flavor explosion, I heated my oven to 425 Fahrenheit and drizzled a little olive oil over some grape tomatoes. 15 minutes later, I took them out of the oven and sprinkled them with a little sea salt. The result was heavenly, and a perfect pairing for my Dilly of an egg salad. The entire lunch was filling, healthy, and incredible delicious. For those of you on the Weight Watchers program, you’re looking at a mere 6 WW Plus points. Enjoy, everyone…. SPRING HAS SPRUNG! If you’re an egg salad lover like I am, you should also check out my sweet and tangy egg salad recipe. 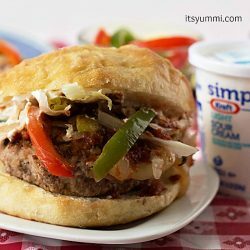 It’s made with a homemade kumquat dressing that brings amazing flavor! 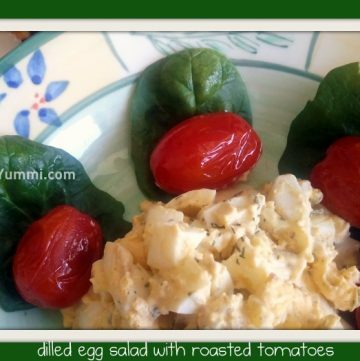 I hope you enjoy this egg salad recipe! 1 pint of grape tomatoes, rinsed and drained. Place eggs in a saucepan and cover with cold water. Bring water to a boil; cover, remove from heat, keep the lid on the pan and let eggs stand in hot water for 25 - 30 minutes. Drain and rinse with cold water. To easily peel the eggs, put the lid onto the pot you cooked them in and shake them a few times (like you're cooking popcorn on the stove) Peel & chop the eggs. In a large bowl, combine the egg, mayonnaise, mustard, dill, paprika, onion, salt, pepper, and garlic powder. Mash well with a fork or wooden spoon. 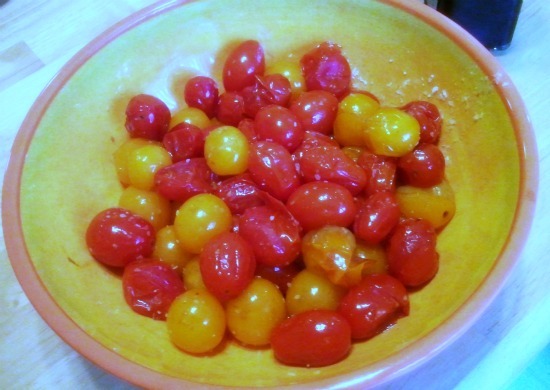 Distribute the tomatoes onto the cookie sheet and drizzle with olive oil. Roast in the oven for 15-20 minutes, until they are slightly browned, aromatic, and starting to shrivel slightly. Remove pan from the oven and sprinkle the tomatoes with sea salt. Sounds like a perfect Spriny dish! Oh, we Spring ahead one hour this Saturday…Omg!! 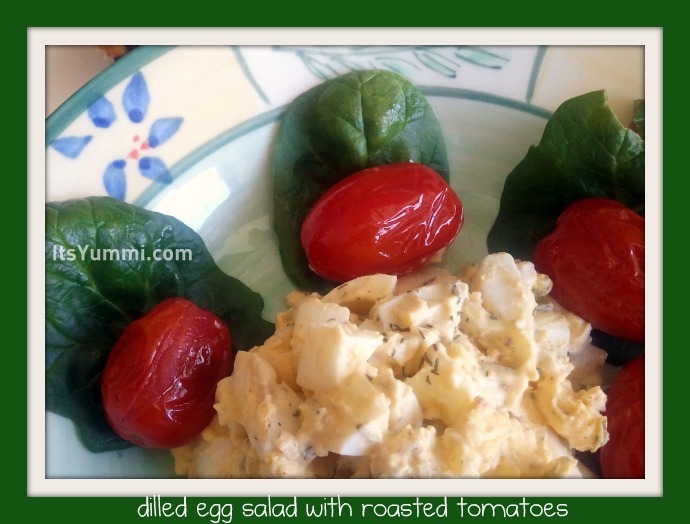 Becca’s got it going on with her YUMMI Dilled Egg Sald & Roasted Tomatoes……..And you wonder how I continue to eat so good?